At Comic-Con 2012 we saw six of the statues that will be released in Weta’s range of statues for The Hobbit: An Unexpected Journey. 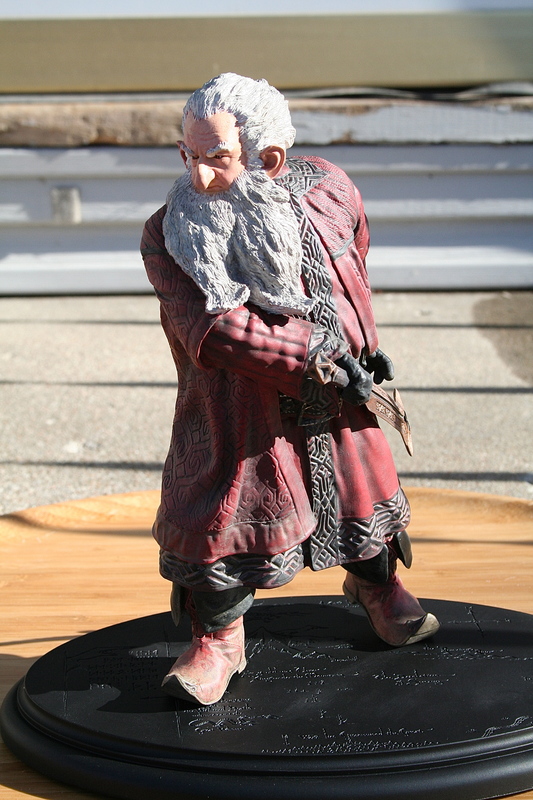 One of the six statues at Comic-Con was of the character Balin who was a member of the traveling party and would later retake Moria (though many people’s introduction is of him in his tomb). 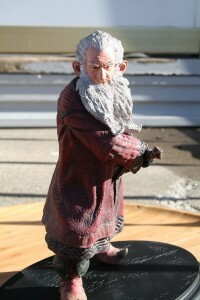 Balin is the fourth statue released in this line. His brother, Dwalin, is the fifth (review to come) and he makes another fantastic addition to the growing line of sculptures associated with this great movie. 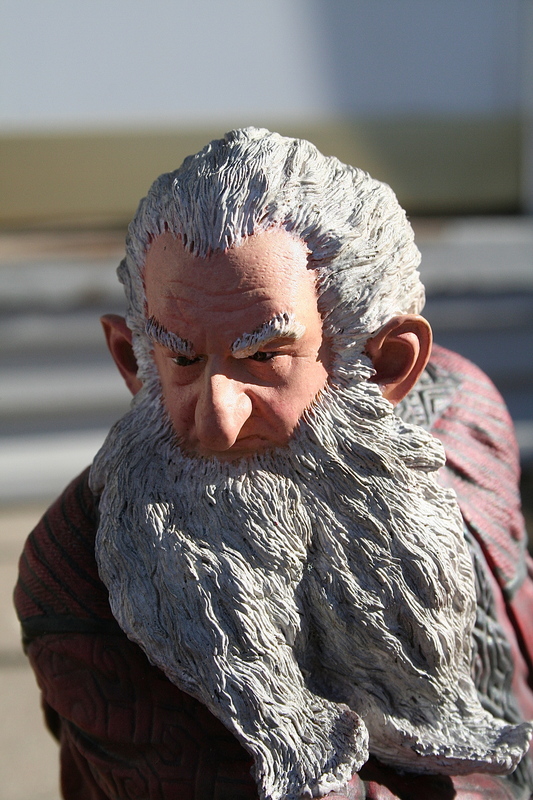 Balin was one of the many dwarves of the Lonely Mountain driven into exile by the dragon Smaug in the year 2770 of the Third Age. Balin would actually make two trips to try and retake the Erebor. One of a venture with Thrain (who was captured), and the second with Thorin Oakenshield in his successful quest to reclaim his legacy. After years of success once Erebor was reclaimed Balin cast his eyes on an even-greater prize — Khazad-dûm. He would be initially successful, but Balin’s new realm lasted a mere five years. The tragic fate of Balin and his kin remained a mystery until the Fellowship stumbled upon his tomb during their journey through Moria. The graphics on the box with Balin are similar to those that we saw on the box of Thorin. The front of the box features great design work down the side. It even looks very Dwarvish, though the design varies to the one used on Thorin or the Dwalin box. Also on the front you have a great shot of Balin, graphic work for the title of the movie, and of course the Weta logo. The sides present a couple of different looks with one showing great shots of Balin from different angles while the other side show some of the other products that will be coming out for The Hobbit: An Unexpected Journey like the Dwalin statue, Thorin’s Map, and the Key to Erebor. The back of the box contains a great story on Balin as well as information regarding details of the character and statue. The styrofoam packaging on the inside is typical of what we’ve come used to getting with these statues. Lindsey Crummett is a new name to me and I would imagine will be to most of you who have been collecting statues based on the characters of Middle-earth. However, after adding Balin to my collection I have to say I am eager to see what else Ms. Crummett has to show us. The spot-on likeness to Ken Stott’s portrayal of Balin is exceptional! The likeness is scary in a good way that it really feels as if he’s been ripped off the big screen and placed on a shelf. While the sculpt and likeness are excellent, Ms. Crummett did not miss a beat ensuring the rest of the statue was equally good. The embroidery work on his outfit is also very well done and you see the great Dwarvish design of his outfit, which looked beautiful on screen. The execution of Balin’s mace is also superb on this statue. The actual prop is finely detailed with Dwarvish designs. I imagine these must be difficult to transfer to a much smaller scale. Yet, having seen the larger prop replica and compared it to the statue, the quality of reproduction is fabulous. Even though we’re now five pieces into this line I’m still loving the Thror/Thorin’s map on the base. So glad that Weta decided to go with this design. The paintwork on Balin is strong and I believe the best in this line so far (not that I think any of them have had issues). The quality of the paint job brings out the clean lines and the detailed work on the statue. The skin tones are exceptional with the proper use of tones making it look very much like real skin. The job done on Balin’s outfit is equally as good. The paintwork is what helps this look like it was screen used, with the proper coloring matching the outfit worn by Ken Stott. Even his boots show wear through the the paintwork. They look like they’re dirty. As with Orcrist, Balin’s mace came out looking fantastic. You get a great bronze look to the weapon which it had on screen and it looks like its been used in the real world. Critically, the paint enhances the mace’s sculpted details rather than consuming them. Balin retails for $230 — a fair price considering the exceptional quality of this statue. This is some of Weta’s best work all around on any single statue and if you enjoyed The Hobbit and the designs of the movie you will want to add to your collection. Even with this statue being an open edition I wouldn’t wait too long to get it, as you never know when the open period could be closed. If Balin and the other four statues are any indication of how this line is going, we’re in for a real treat with the remainder. Balin is an open edition statue with a retail price of $230. He’s also in stock as of right now so don’t delay.